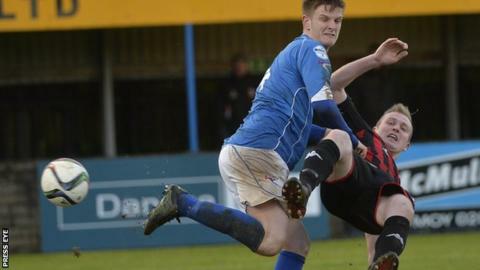 Dungannon Swifts manager Rodney McAree aims to continue his team's recent good form against Premiership leaders Crusaders at Seaview on Saturday. A 1-0 win at Coleraine last weekend made it just one league defeat in seven games for the Swifts, who have moved up to seventh in the standings. The pressure is on the Crues, who lost 4-3 to Carrick on Tuesday and are not just two points clear of Linfield. "There is positivity and we want this form to continue," said McAree. He added: "We'll go to Seaview with a gameplan although keeping a clean sheet against the Crues is never easy." Coleraine will be seeking to bounce back from the Swifts defeat when they take on Glenavon at the Showgrounds. The Bannsiders are fifth and five points behind the Lurgan Blues in third. "Gary Hamilton has Glenavon flying and they will come here in buoyant mood," said Coleraine boss Oran Kearney. "They are one of the teams we are chasing and a victory would be crucial in terms of making up ground." Warrenpoint Town are four points adrift at the bottom and they face a Shamrock Park encounter against Portadown. Saturday's other game sees Carrick Rangers continuing their bid to avoid the drop, with Glentoran their opponents at the Belfast Loughshore Arena.